Year 2007 has been quite an eventful and a kind year for me. In some sense it was like 2003 when I had met four fellow maniacs first time during a classic tour of Scotland in May followed by an adventurous journey in late November from Amsterdam to Turckheim with Mark Adams, our alumnus American Maniac. I was fortunate to taste some of the best whiskies in my decade and half of dramming this year, thanks to Diageo and Sukhinder Singh. 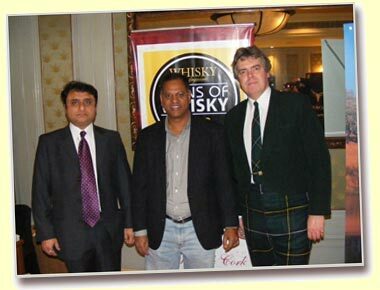 And finally, the recent Malt Maniacs Awards 2007, as usual, contributed some more stunners. As a result of these events, my malt mileage shot up by about 300 and now fast nearing a respectable 1000 mark. Having tasted about 300 whiskies, I thought why not list out a personal list of best ten in the year? Well, here is a brief account my best ten whiskies in 2007. The rating is from bottom to top. Charlie Smith the distillery manager who had spent 40 years of his life in the industry was retiring as Distillery Manager on the day and it was a special honour for me when he poured this little dram of Talisker 30 yo in his office. Dave Broom, our fellow Maniac was along with me during the dramming. This is a special bottle available for sale only at the distillery. Nose: Bold- typical of a Talisker but with subtle hints of coastal notes. Lots of sweet and fruity notes, more of which appear later on the palate- you get some smoke, beeswax, peat and pepper. An excellent array of complexities on the nose. Palate: Lots of sweets, round, full bodied and syrupy stuff. Ripe apples, raisins, and resinous with salty hints. Excellent and emphatic finish. Lying just below the Ben Rinnes and fed by the waters flowing down, Aberlour was one of the distilleries the five maniacs visited during the maniacal tour of Scotland in 2003. The burns flowing down the peaty fields ultimately feed to river Spey giving the region its name-Speyside, where one finds the highest density of distilleries per acre anywhere in the world. A’bunath (in Gaelic meaning “of the origin”) is a special whisky created to honour the founder, James Fleming and according David Boyd, the distillery blender, “if he (James Fleming) were alive today, this is how he would have liked Aberlour to be”. There is no age statement on the bottle but the youngest whisky in the vatting, I think should be at least 10 years old. This has won the Supreme Sherry Cask for daily Drams Category in Malt Maniacs Awards 2007. Colour: Old oak with red tinge. Nose: heavily sherried, dried fruits, prunes and figs, beautiful woody notes from rear, some coffee and oriental spices. Palate: very sweet, heavy and oily. It is like drinking something heavenly! Glenfarclas (Valley of the Green Grass), also lying just beneath Ben Rinnes is another Speyside distillery, visited by the five maniacs during the tour of 2003. I still remember our tasting in the room modeled like saloon of the ship “The Spirit of Australia”. This is another Awards 2007 participant that won a Gold Medal. Colour: Almost like treacle. Nose: Rich sherried nose, good oak wood, complex fruits, fragrant with nail polish notes, rich oiliness and grapefruit juice. Palate: lots of tannins, dried fruit extract and mild bitters. Although a bit rough on finish, this is quality stuff. A pretty recent distillery established in 1960s in the Livet valley of Speyside. One finds more of standard 12 years old versions of this whisky and this 35 year is a special find by Sukhinder Singh and it appears that he has bought entire lot of this particular series. If you are in London next time, make sure to visit The Whisky Exchange to get one of these from Sukhinder- i.e. if it is still available. Colour: Dark Amber. Nose: Plum cake with lots of dried fruits. Nutmeg and Camphor. Starts on lots of freshness and sherry in all elegance with a little sulphur note. One of the oldest distilleries of Scotland, Balblair keeps surprisingly a very low profile. Situated in Northern Highlands, the name of the distillery derives from the small river flowing down the surrounding hills. Balblair is one of the less tasted whiskies by me and this one swept me off my feet. Colour: Deep amber. Nose: Very woody! Lots of dried fruits, nuts and interplay of varnished wood with sherried fruity notes. The longer you play on the palate, the longer it develops into complexities. Long Spicy finish much like Talisker. Bowmore in Islay needs no introduction. Islay is the Mecca of all whisky lovers and a must visit at least once in a life time. This Bowmore series has been specially bottled for Asian market by Suntory and I am not sure whether any of these are still available. Colour: Deep amber. Nose: well balanced, with quite a bit of peat and some green chilies. Quite unlike those perfumed series of Bowmores! Some passion fruit and hints of organics. Complex nose. Palate: Very oaky initially becomes sweetish and gradually displays licorice and dark chocolates. Very long, peaty and smoke finish typical of any Islay malt. This is Awards 2007 contribution from Whisky-Doris. According to Ho cheng it could be a traditional Linkwood, which the House of Ballindallochs usually bottle. I strongly felt that this could a Glenfarclas and Luc, our Mr. Glenfarclas agrees with me. Whatever it is, I strongly felt that this could have been one of the over all winners, but in the final run it narrowly missed a Gold Medal. Colour: Old oak. Nose – heavy Fino sherry, nice sandalwood and prunes. Exuberant! Plum cake. Actually I don’t feel like drinking this stuff. Simply go on enjoy the smells emanating out of this. Palate – Rich concoction of dried fruits extract. Round and fantastic body. Superb sherried finish with lots of Asian spices. Only Angels are capable of crafting this kind of whisky! This is another Awards 2007 participants contributed by The Whisky Fair and Ho-cheng thought this was a Longmorn. It was so pale and the tasting notes, in fact corresponded with that of a fine bourbon cask. I truly felt that this could be the over all winner of Awards 2007, but it ended up with a respectable Gold Medal high in the list. Colour: Lemon yellow. Nose- instant beautiful maltiness. Lemon oil, nectarines, thick oily notes followed by orange marmalade. It is like mountain air coming over a bed of fresh flowers and heather. Now you get some thick coconut milk laced with vanilla. Just a whiff of peat and smoke and leafy organics. Palate – The sweetest whisky tasted in the entire year. Highly viscous, goes down the throat without any edges- Silky smooth. This is magical stuff, made by some Druids in the desolate Scottish woods. Spectacular! Longmorn is another low profile Speysider which ranks in the same league as Glenfarclas, Macallan and Aberlour. May be it is not marketed as much and the owners have left it to the concept that the true connoisseur would find it any how and any way. Colour: Such dark Colour! Nose: Splendid rich sherry, bold fruity notes with lots of dried fruits and nuts and something very meaty about it, like rich beef soup. Palate: First sip makes you utter Oh, my god! What a matching mouth feel with nose. This reminds me of last year’s MMA winner Yamazaki. The dried fruits in the form of sultanas, figs and prunes keep coming back in hoards. Splendid body without any repulsive hints of tannis that you expect in an over aged sherry cask whisky. Smooth, velvety finish and after it goes down the gullet you make that sound with the roof of your palate. Umm….. A perfect after dinner dessert whisky. No matter what I do and what ever whisky I comment upon, when it comes to naming my favourite whisky of the year, Talisker is the first name that comes to my mind. There are several reasons for this. I tasted some of the best Taliskers in the desolate islands in the Inner Hebrides during this year’s Classic Malt Cruise, visited Skye and drammed at the very distillery with Charlie Smith and most importantly, this 1955 Talisker (courtesy Sukhinder Singh) comes from the same year I was born. Colour: Mahogany. Nose: Quality sherry with whiff of sea breeze, woody- akin to cedar and some camphor from rear. This Talisker is more or less same as the 1957, 53.5% Gordon & Macphail’s licensed bottling which is an all time favourite of all the Malt Maniacs. Excellent fruits with subdued peat and aromas coming from fresh prawns grilled on charcoal. Palate: The typical Talisker explosion inside the mouth. Very sweet and chewy with lots of power. An array of dried fruits and nuts. Absolutely satisfying and mouth watering finish that lingers till next day.